Our neighbourhood is in an older part of Edmonton, just across the river from downtown but far enough away that it has more of a quaint aura. It is filled with late 19th century homes and small, local businesses that house artists, documentary film-makers, pretentious restaurants that are only open three days a week, organic food shops selling everything from local coffee to high quality pet food, and – of all things – image consultants. We are also lucky enough to have a small veterinary office less than five blocks down the road, right next to an artisanal bakery and a diner that advertises five-dollar breakfasts. Until last week, I never noticed the cat that lives inside the vet clinic. I don’t know how I missed him as he sleeps in the window of the office right by the sidewalk. But now that I have found him, I can’t resist an opportunity to pass the clinic to say hello. When we first saw him lounging on top of his comfy furniture, I made her sit away from the window for fear she would scare him off. 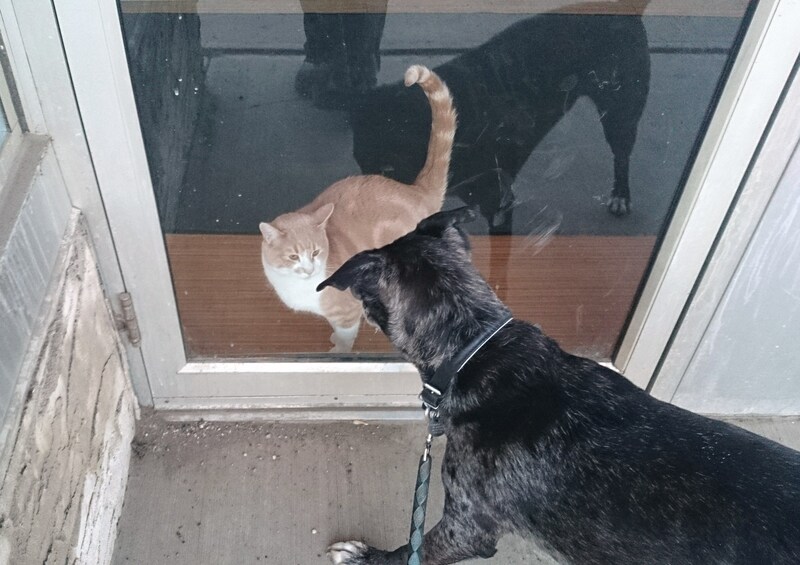 However, being a kitty who lives in a pet hospital, he seems to be accustomed to dogs and instead of darting away, he leapt down to the door in order to greet her. I was stunned by how intrigued he was by her and how calm Shiva was in return. I never would have let her get so close if there hadn’t been a door in the way but I have a feeling even without the partition they could be good friends. Shiva has always adored cats. Unfortunately, she comes on too strong and most of them despise her in return. I am so glad she has found a quasi feline companion. Even if their affection must be tempered by glass. 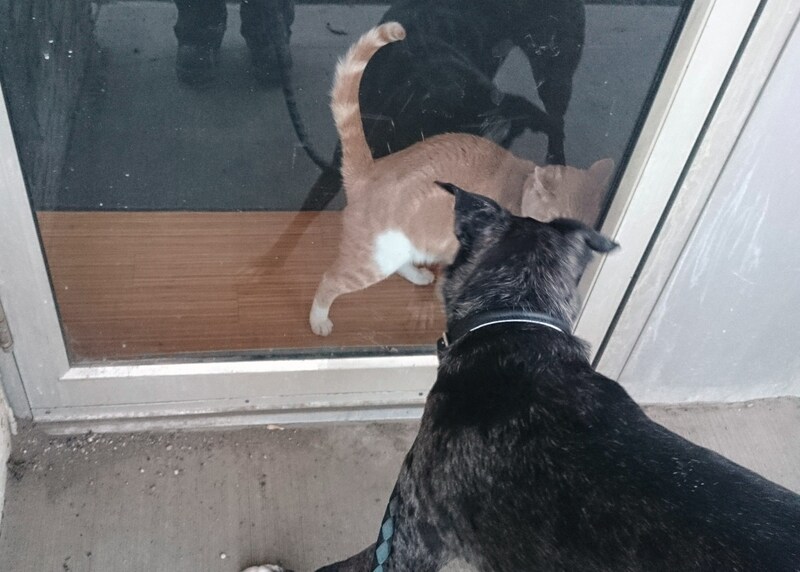 whenever Mity sees a cat he tries to lick it’s nose. Strangely the cats do not appreciate this and he looks most upset when the turn and run. 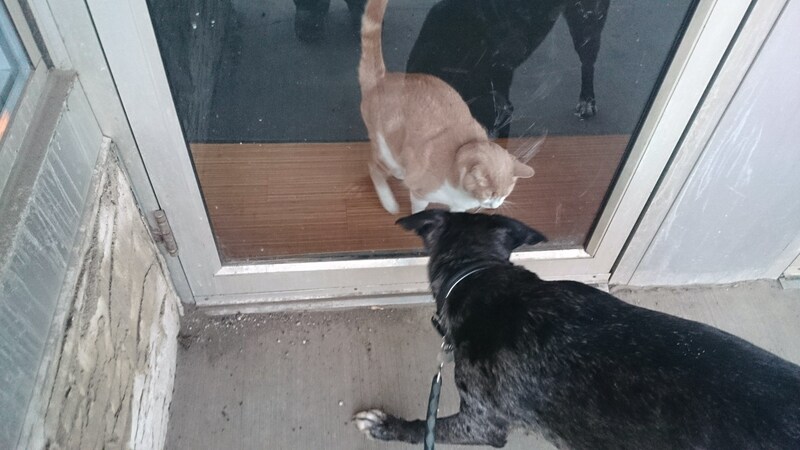 Except the one cat that didn’t see the small grey dog and he managed to land a kiss on her nose – i don’t know who was more stunned the cat or Mity!! I am so please Shiva has found a friend. Ah, that’s so cute! I’m surprised at how calm Shiva is, Del would be going bonkers! Nice! I bet that cat is used to all sorts of company! Also, your neighbourhood sounds Kensington-esque and amazing. My brother lives close to the U of A there, and I am always jealous of his established hipster neighbourhood with old houses and huge trees. Beats my suburb any day! Hi Shiva, I like cats too. There’s a real friendly one that likes to rub up against me!